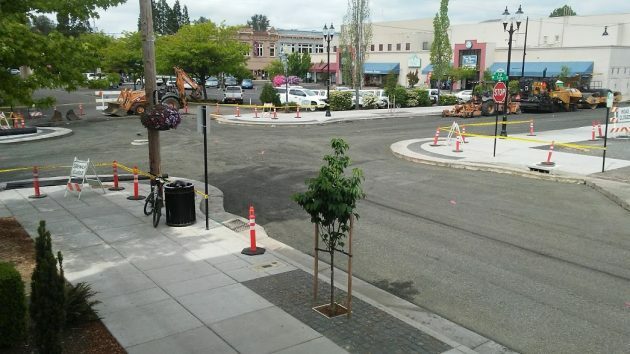 The intersection of Third and Ferry awaits new pavement in this view Saturday from the public library’s steps. City Manager Peter Troedsson sent the city council a breakdown last week, and he emailed me a copy. The actual costs won’t be known until some time after the project is completely finished and all the bills have been paid. But so far, the anticipated total cost of Phases 1 and 2 of the downtown street work — new sidewalks, paving, lights, trees and furniture — is $10,612,200. That’s up from about $9.7 million in January. One factor in the increase was that the council, as the Albany Revitalization Agency or ARA, decided to increase the extent of the repaving of seven blocks of Second and Third avenues, turning the work into a full reconstruction so that the result would last much longer. ARA is the city’s renewal agency, run by the city council. It’s a little complicated, but ARA is the governing agency of CARA, the Central Albany Revitalization Area. Anyway, CARA or ARA — being the same outfit, essentially — is funding about $8.4 million of the streetscape job with money it already had or borrowed. It gets its revenue from property taxes collected on the increase in taxable value of the 900-acre central Albany urban renewal district since it was formed in 2001. Another $1.4 million for the street work is related to underground utilities and comes from the water system’s capital fund. To cover overages, the water fund also contributed $555,000 from reserves. 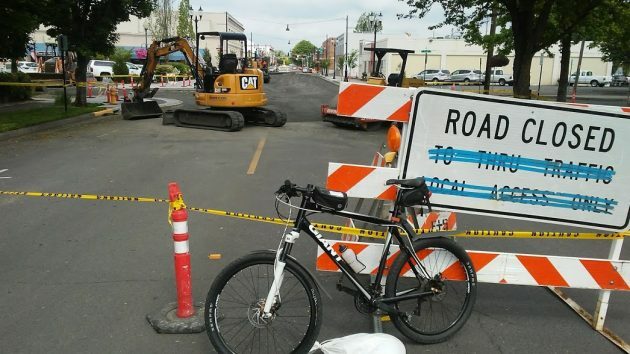 Finally, ODOT is reimbursing Albany $600,000 for work along Highway 20, meaning Ellsworth and Lyon streets. The barriers should come down as each block of the street reconstruction is finished. All seven blocks should be complete in July. Albany needs a kidney replacement, but the council opts for a face-lift instead. Choosing beautification over necessity is not good for one’s long term health. I am just curious. With everything that is being done to downtown Albany, what action is being taken to attract new business’s? Does Albany have some major players moving into the downtown area? Ask the chamber of commerce or more importantly ask Mr. John Pascone who has supposedly working to get businesses in Albany/Millersburg for over decade. Hasso: The way you explain CARA and ARA is exactly how I have figured out how it works, but our esteemed mayor, Sharon Konopa, always condescendingly tells me that “I don’t understand how things work!” Ticks me off just to type how she talks to me. All I can do about that is vote for a new mayor next time she is up for re-election. Nice of Troeddson to e-mail you the updated costs. That’s refreshing…coming from our city hall. So you want to know where some of this is going….As you may know, the Carousel has a new documentary out by Peter Daulton that premiered on local OPB last night, We just received word that nationwide PBS stations are starting to pick up the documentary, Phoenix and Kansas City just signed on and many more stations are scheduling viewings. By the way just received word one of the Carousel’s posts just went viral, over 100k views. Also a shout out to Mr. Sam Elliot for visiting our Carousel and Downtown. Success is scary and needs to be managed. I would suggest CC and staff start thinking about how some of these issues that are going to start surfacing, need to be addressed. Albany is changing and is going to need to be managed in a more complex way, no doubt there will be some debate and discussion, but this ship is going in the right direction. Seriously? Meanwhile the cost of affordable housing has gone through the roof as the regulatory burdon of building things here is difficult when compared to anywhere but Corvallis. The economy is strong everywhere right now for a number of reasons, the carousel is likely way way down on the list. As the Carousel’s reputation spreads, the longterm 2-3 years, the average time to cross the two city bridges will be 40-minutes to an hour. The old downtown hotel is a short term future gold mine. I asked a simple question. Seems a lot of people are on the edge of their seats about our downtown area. I was hoping for more restaurants and shopping for men and women’s apparel. Maybe some more specialty shops. That’s all.